Julie Castelluzzo addresses issues of access to and discovery of electronic resources such as e-books and e-journals at The Cooper Union. She is also a subject specialist in electrical engineering and computer science and enjoys working closely with students and faculty in those disciplines. Originally from New York's Finger Lakes region, Julie earned her Bachelor of Science degree in psychology at Syracuse University before relocating to New York City in 1987. 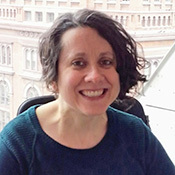 Prior to joining The Cooper Union as an assistant librarian in 1995, she was technical services librarian at the investment banking library of Kidder Peabody & Co., Inc.
Julie holds a Master of Science degree with honors in library service from Columbia University and a Master of Science degree in computer science with a specialization in AI from the Courant Institute of New York University. She is a member of the Association of College and Research Libraries (ACRL), a division of the American Library Association, as well as the Association for Computing Machinery (ACM). Julie's accomplishments include coordinating the library's development of digital collections for the Cooper Union 100th Anniversary Photographs and the Cooper Union Annual Reports 1860-1884. She currently serves as a member of the Institutional Review Board, the Humanities and Social Sciences Curriculum Committee, the Cooper Union Professor Committee, and the executive board of the union for full-time faculty and librarians, the CUFCT.